The amino acids in rice and beans come together to form a complete protein, making a simple way to get both complex carbs and protein in a single vegetarian meal. 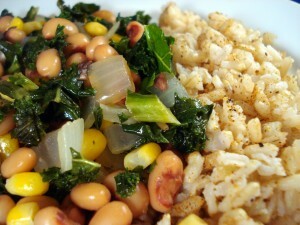 Add some versatility to this universal staple and you have a delicious, healthy and inexpensive meal. 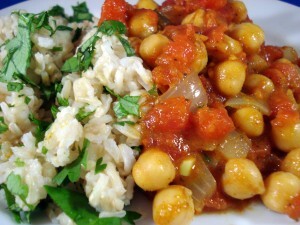 Stir the curry powder and cinnamon into the chickpea and onion mixture. Fry for a minute, then add the ginger and tomatoes and their juices. Cook on medium-high heat for 5 minutes, until the tomatoes no longer taste raw. Stir the cilantro into the rice. Add salt and pepper to taste. Add the celery and olives to the bean and onion mixture and fry for a few minutes to soften. Stir in the lemon juice and parsley and heat through. Stir the dill into the rice. Add salt and pepper to taste and a can of chopped artichoke hearts. Fry the kale with the bean and onion mixture for a few minutes until wilted. Add the cider vinegar, Worcestershire sauce, and corn, heat through. Add salt and pepper to taste. Try stirring in some chopped yellow squash from the garden. 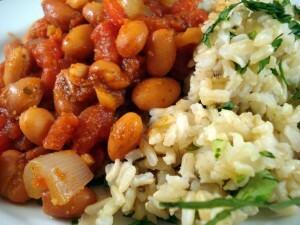 Stir the cumin and chili powder into the bean and onion mixture and fry for a minute to coat. Add the can of tomatoes and lime juice. Cook on medium-high heat for 5 minutes, until the tomatoes no longer taste raw. Stir the cilantro into the rice. Add salt and pepper to taste. Serve with a side of sliced avocado and warm corn tortillas.